This Saturday, most of the guests went off walking while in the surrounding hills trying to take a photograph of Shenandoah from the same angle as a photograph taken of Endurance just before she sailed for the Antarctic in December of 1914. On Sunday morning there was a great spurt of activity and all the guests were up early digging out the ski gear for a trek to the snow slopes to ski down a glacier. The deck was covered in gear: poles, skis, skins, boots, the lot. By the time they had got themselves sorted out and ashore it was gone eleven. They all wore their ski boots ashore, which must have made walking across the bog quite hard work. Tim Carr had gone with them as a guide so I felt confident in their safe return. The rain started in around midday and the shore party carne back at about three in torrential rain. They were all soaked and frozen, 3 hours climbing for 15 minutes downhill. Well, to each their own etc. The bad Weather continued throughout the day and night until three in the morning when it went calm and we took a turn around our anchors. Using the RIB, we turned the boat round, the wrong way the first time, and finally the chains clear and port anchor up and down. It was obviously not going to break out in a hurry so I turned in and left it to the watch. By Monday morning it was blowing hard again, gusting over 50 knots, and once again both anchors were down. However by midday the wind was backing off and there was pressure to get under way. It was very clear that we were going to get the maximum possible out of this holiday as we were not likely to come this way again and that the pressure was on to get as far as the Drygalski Fjord in the South East end of the Island. I would have preferred to make our trips with shorter hops and more time to explore but that is not the way of things these days. Tim came on board in the early afternoon and we got our anchors and departed fromKing Edward Cove. It was a funny feeling departing Grytviken after only three days, but it felt like leaving civilization, home and safety. Our destination was a beach landing near the Nordenskold glacier where we were to put a party ashore for walk across a neck of land to Ocean Harbour. This was to be our first beach landing in South Georgia and while we managed to get all the guests ashore with dry feet the same could not be said of Tom. There was a slight sea breaking on the boulder beach as the boat came in and Torn jumped over side to hold the bow. The beach, unfortunately, was quite steep too and there was a swell up the transom of the RIB. Tom disappeared under water still holding the painter. He was wearing waders but that’s not much help when the water is up to your shoulders. We quickly realised that in a lot of circumstances the smaller inflatable with a 10-horse motor was to going to be a lot more practical. While the shore party worked their way over the hills, we were to sail around and meet them in Ocean Harbour. Once clear of the shelter of Cumberland Bay the wind came in fresh 35 to 40 knots from the West. Our course took us though one of the plain blue sections of the chart, which was not encouraging. The approach to Ocean Harbour was made difficult by the large number of stranded bergs in the entrance. Visibility was moderate in rain, failing light and a strong wind up the stern, the conditions on deck were generally miserable. We had help from Tim who was with the guests and who, from where he was on the mountainside, could see the gaps through the bergs. Instructions from Captain to the mate, “We’ll run through the brash and hand sail in the lee of that berg”. We dropped the RIB and felt our way into the harbour where we dropped both anchors, which turned out to be a mistake. Spectacular anchorage, very well protected, mountains all around and wild life everywhere: caribou, seals of all sorts and birds. Also the wreck of the Bayard, a three-masted barque built in Liverpool in 1864, which had been used as store ship and which had broken away from her moorings and gone aground. The anchorage was still and the barking of the seals comes clearly across to the yacht, as does their very particular smell. In some of the anchorages there are hundreds of seals so that while the bark of individuals can be heard it is against a background that is almost a continuous roar. A small group of us went across to the Banyard in the morning and scrambled on board. Easier said than done as the deck is covered with a few generations gooey guano. Once on board the danger starts as the deck is covered in tussock grass fertilised by the guano and great care has to be taken not to step or fall through the layer of dung. The ship itself is amazingly intact with the three lower masts still standing. We kept the visit short, as there was pressure to get under way for the next stop. Back on board we started heaving up. The fisherman came up first, it felt heavy but we could not see a reason why until it broke the surface. God knows what was happening during the night but for a start the anchor was down, it was solid with kelp and it festooned with bights of its own chain. One thing was obvious and that was we had to get the anchor the right way up first before we could start clearing the chain. Someone was going to have to go in the water and pass a line through the ring. An appeal for volunteers was put out and Nick Atkinson stepped forward. Nick is a mountaineer and physically tough.I had seen him swimming round Shenandoah in Stanley harbour on arrival there. I told him to put on a wet suit and get ready to go overboard. He was back a minute later to say he was ready to go. I thought to myself that that was rather quick and I turned around to see him standing there in nothing more than a little pair of black swimming trunks. I told him that he was mad but the sea was calm and the temperature was around four degrees and if he reckoned that he could do it why not. He went over the side with a two-inch line, dived on the ring and was up and out and back into the RIB very quickly. Our two doctors on board were horrified and said the lad risked a heart attack and worse, however I think it depends on conditioning and I well remember a photograph of my cousin swimming in a melt hole on an iceberg While he was in the Antarctic with SirVivian Fuchs back in the sixties. 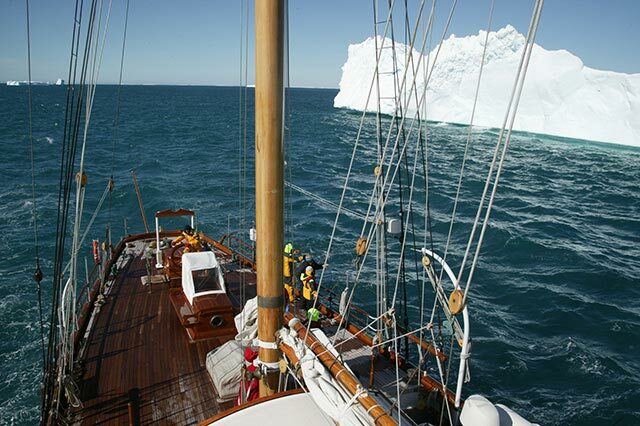 We started heaving up at ten and it was close to 1300 before we were finally underway and threading course through the icebergs at the entrance to Ocean Harbour. The blubber spades that we were recommended to take were invaluable as no matter how clear the space when you let go, the chain always gathered up the kelp. Our next destination was to be an open anchorage off the beach in a place called Gold Harbour where one of South Georgia’s biggest King Penguin colonies is established. Because of the lost hours in the morning we motor sailed down the coast. The weather remained clear and in the distance to the East We could see one of the giant tabular bergs that was aground off the coast – the face of the berg visible to us was probably about 30 miles long. We made the anchorage off Gold Harbour by the early evening. I never was a one for an open roadstead and while there was better shelter inshore. We were too big and too deep to take advantage of it and so we laid well offshore and rolled quietly while all the guests went onshore. The weather was line with the wind off the shore 25 to 30 knots. It fell away later and then turned to come in from theEast, which turned us around so that our head was out to sea, but at least we rolled less. Chef tells me that we are a little short of flour and could I tell the guests to eat their bread instead of just taking a snap or two out of the corner and throwing the rest away. We will have to plead with the British Antarctic Survey supply officer for a few kilos on our way back. Half of the crew were up and ashore at 0530 this morning for a chance to get ashore to the penguin colony before departure. I usually get out of my bunk early in the morning the only reason being that I like to have my breakfast on my own in peace and quiet. This morning it was especially quiet. The weather was fair in the morning, overcast with a light Northerly breeze. Drygalski Fjord was the objective. We ran down the coast, the only chart covering this area was one that comprised the Whole Island so that it was a bit short on detail. One of the few things that you can count on is that where there are rocks below the surface there will probably be an iceberg stranded on the top of them. Maybe not true for every year but it was certainly true of our visit. As always on our coastal runs – which we always did in daylight – we kept lookouts to port and to starboard and thankfully the guests were always willing to help. Growlers were the worst, as they would often appear to be quite small until a swell passed that would make them rise up out of the water like an emerging Kraken, for those that ever read the novels of John Wyndham. Off Drygalski Fjord there were numerous very large bergs that blocked the view of the entrance but there was space enough for us to thread our way through. The weather was quiet and we carried on up the full length of the Fjord until we came to the brash from the face of the Drygalski glacier. Three glaciers exit into the Fjord and the ice was everywhere. At this stage I had two lookouts on the bowsprit, the one on starboard would point his finger for me to go to starboard and the one on port would point his finger for me to go to port. As we were moving very slowly with barely steerageway I just kept on going straight ahead. It was not until we were back in Antigua and were cleaning up the damage to the paintwork done by the anchors that someone pointed out a nice round dent on the starboard bow. I don’t know where it came from, but my guess is that it came from our trip up the fjord. We put the RIB over the side and the photographers went away to the West side of the fjord to climb ashore and get some superb pictures of the yacht with the glacier in the background. There was no wind and no noise and in the stillness the noise of the glacier was like the sound of heavy artillery and the amount of ice falling down the face of the glacier seemed disproportionate to the volume of sound. To say that we were lucky with the weather would be an understatement as for the rest of the time that we were in that area the wind was coming down the fjord in tremendous blasts. Photographs taken, we headed back down the fjord to the entrance to Larsen Harbour. Larsen Harbour is another fjord where I hoped to get a stern too berth as there was a mountain climb as well as a ski excursion and penguin visits planned before the weather broke at the weekend. The reality of the berth we were searching for was difficult to see on the chart but in fact there was a bluff about twenty metres high with deep water right up to its foot. The first time we went in I dropped to far out and ran out of chain. We got it right the second time round and ended up with starboard anchor out in the fjord, port anchor pretty much straight ahead, lying a short way off parallel to a rocky beach covered in seals from where the snow covered ravines rose straight from the beach to the mountain tops, a height of two or three thousand feet. We had four lengths of 7 X 19 Wire rope with eyes at each end and these were wrapped around any handy rock for the stern lines. It was a better berth than the IYCA, just a bit short on facilities. The open ocean was invisible to us and all around was snow and ice, rocks and mountains and everywhere seals. We felt very secure. The guests were all ashore with Tim in the afternoon to hike in the mountains and visit a penguin colony. My log does not record which sort of penguins they were. The excitement, the adventures ashore and the exercise were all having a wonderful effect on the guests appetite for both food and drink. The chef was a happy man in South Georgia as compared with the guest appetite in the Mediterranean summer when the menu never seems to go much beyond a little grilled fish and a bit of salad and an occasional sorbet all washed down with carrot juice.